Home Allergies What Is Milk Protein Intolerance? Milk allergy is among the most common food allergies that affect children around the world. In this condition, the immune system of your child responds abnormally to milk and any product that may contain milk. Most children are allergic to cow's milk, but their immune system can react to milk from goats, sheep, buffalo and other mammals as well. Some children will develop an allergic reaction within a few minutes of consuming milk, while others may not show any signs of a reaction for hours after drinking milk. Do you wonder why your child's immune system reacts to milk protein? Keep reading to learn more about milk protein intolerance and things you can do about it. What Is Milk Protein Intolerance in Babies? Your baby has milk protein intolerance if he/she develops a reaction after consuming milk. Your baby will become irritable and may even have upset stomach because of an allergic reaction to milk. Keep in mind that children who are allergic to cow's milk are usually allergic to goat's milk as well. In fact, some of them may react to protein in soymilk. Infants who are formula fed are more susceptible to milk allergies as compared to those who are breastfed. The real cause of this allergy is not clear, but it could be genetic. It is important to talk to your doctor if your little one has a milk allergy, so you could learn about some alternatives to milk and dairy products. Many parents don't understand that what their child is experiencing is caused by milk protein intolerance. There are some specific symptoms associated with milk protein intolerance, such as gas, bloating, diarrhea or other digestive problems. For proper management, it is important to confirm if your child has milk protein intolerant or not. Here are some ways to diagnose milk protein intolerance. Since there are no tests available to confirm if you or your child is allergic to cows' milk, using exclusion diet is your best bet here. It involves taking cows' milk out of your diet and see if your symptoms improve. Your baby may begin to feel better after a couple of weeks of using an exclusion diet. It is important to work with an experienced dietician because you will have to include milk back into the diet after a few weeks to see if symptoms return. In some cases, your healthcare provider will decide to make use of some allergy tests. They order a test especially when your child or infant experiences a reaction immediately after consuming milk. This could be a skin prick test. In a skin test, your doctor will place a very small drop of liquid prepared using cows' milk on the skin of the inner leg of your baby. They will then prick the skin and see if a red weal appears or not. The test usually takes 20 minutes and the results really help determine if your baby is allergic to milk protein. Your doctor may also check your baby's blood pressure and also ask you about their bowel habits. They may even ask for a stool sample for further testing. They look for blood in the stool because it's not always visible. They may also check your baby for anemia. If your baby has a milk allergy, it is important that you reduce the amount of dairy products you eat because it may transfer to your baby through your breast milk and may cause milk protein intolerance. Also, talk to your doctor about other alternative ways of providing your baby with enough calcium and nutrients. If your baby is allergic to formula milk, you may consider switching to another formula, which should resolve the issue and the symptoms will go away completely in a couple of weeks. It is still important to give your baby a hypoallergenic formula until your baby is one year old. Milk protein intolerance is a condition in which your infant's immune system reacts to milk protein. It is among the most common types of allergies in children, affecting 2%-7% of children worldwide. 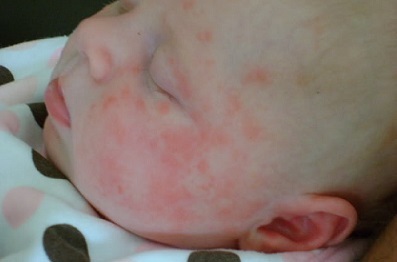 It is more common in babies who have eczema. Lactose intolerance is different because in this condition, your child cannot digest lactose. It usually happens due to viral gastroenteritis or a tummy infection. Once your baby consumes lactose, it will take about four weeks for the symptoms to go away.